Greg Coleman, an intern with Hopeworks' GIS program, indexes locations of water lines in Camden. The subject was water. Waterline location, to be exact. Seated at a conference table on the second floor of Hopeworks 'N Camden at 543 State St. were four people who knew how to locate shutoff valves with pinpoint accuracy in the event of an emergency. The four - Chris Newbill, Michael Evans, and Gregory Coleman, and their boss, Luis Olivieri - are the GIS (geographic information system) team at Hopeworks, a tech-job-training nonprofit. They have been using GPS technology to map the locations of the mains and valves in Camden neighborhoods. A year ago, Olivieri said, Voorhees-based New Jersey American Water, which has been spending millions of dollars to update its maps, "found out about our program and approached us to do a pilot project mapping 71/2 miles of Camden's Cramer Hill neighborhood." "We finished ahead of schedule, and they gave us 67 miles more to do," which the team also completed in short order, said Olivieri, an adjunct professor of GIS/GPS technology at Community College of Philadelphia and Burlington County College, and Hopeworks' GIS director. Especially at this time of year, the freeze-thaw cycle can rupture century-old water mains and leave customers high and dry for days. Finding shutoff valves for the lines so they can be repaired is time-consuming. The locations often were written on scraps of paper by workers who based them on then-current references, then were rewritten in map books, which, even when computerized, may be based on outdated information. "If the book said the valve was '20 paces from Mrs. Brown's yellow house,' it is likely that the paint color has changed or the building is no longer there," said Peter A. Eschbach, director of communications and external affairs for New Jersey American Water. Descriptions giving "distance from the curb" don't help, since curbs have moved in 100-plus years. New Jersey American has 20 employees working to locate 9,000 miles of mains and valves, and "it just isn't enough," Eschbach said, explaining the continuing partnership with Hopeworks, the Philadelphia Chamber of Commerce's Nonprofit of the Year for 2016. 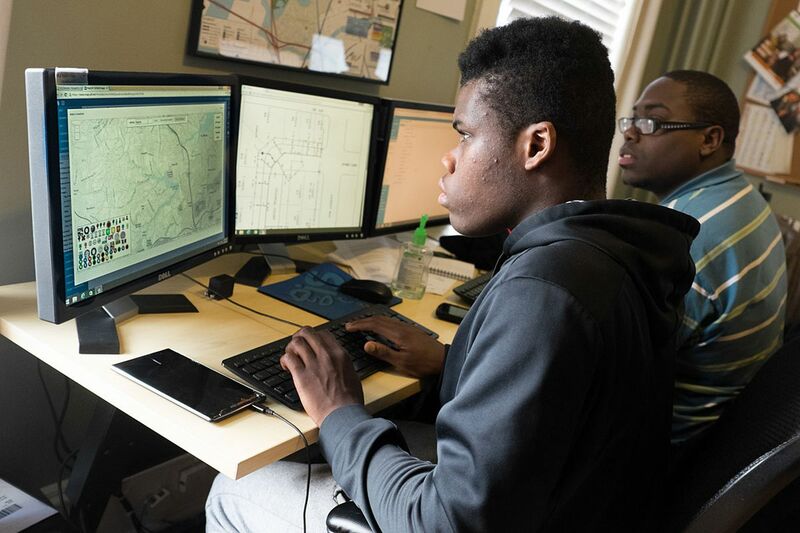 Technology that senses the locations of mains and valves remotely means workers "don't have to dig all over the place to find the shutoff valve," said Newbill, who began an internship with Hopeworks in October, first collecting data and then working on indexing programs. The maps created can show the width of a main and whether valves can be closed by hand or require a machine to do it, Eschbach said. Hopeworks' GIS business has produced parcel maps, digitized land-use information, and created online maps. Besides technology training, Olivieri said, interns, who are paid, are "taught how to behave in a work environment and how to be part of a team." This is not Hopeworks' only business, but is a growing part of the nonprofit enterprise founded by Camden Lutheran and Catholic churches that opened in March 2000. Hopeworks offers training for Camden's young people in skills in the growing high-tech industry. It has two other businesses besides GIS, said Dan Rhoton, the executive director: It designs websites, with more than 400 paying clients, mainly small businesses and nonprofits, and also works with users of cloud-based Salesforce as consultants. A goal over the last 15 years has been to encourage program participants to stay in school and receive their diplomas and those out of school to obtain GEDs, even continuing on to college. Fifteen alumni are in college, the highest number in Hopeworks' history. Its coed residential community, in a former convent a few doors up State Street, offers college students ages 18 to 24 with jobs at Hopeworks a safe, secure place to live while pursuing their goals, said Coleman, who moved in this month. Neighborhood reaction to the team at work on the street has been positive, Olivieri said, once people they hear an explanation of what members are doing. "Residents just want to make sure they are being paid," he said.